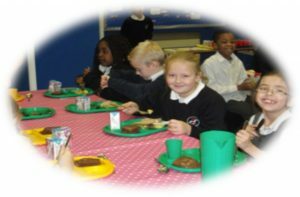 At Whitgreave Primary School, the pupils are encouraged to make healthy choices when eating at school by providing them with the correct foods. To promote a whole school approach to a healthy lifestyle. To encourage pupils and staff to make informed decisions on a healthy lifestyle based on positive attitudes and information. Apple juice and orange juice. Fresh fruit (apples, oranges, melon, grapes kiwi, pears and seasonal fruits). Water, orange and apple juice. School lunches are designed to meet the Education (Nutritional Standards and Requirements for School Food) (England) Regulations 2007. They provide a rich and diverse array of foods which cater for all preference. Each meal has been carefully designed to contain all elements of nutrition need by growing children.